My Mom always made the holidays special. We made flower baskets to hang on our neighbors’ doors for May Day. Easter was a big day of hidden eggs and lots of chocolate. Whether Halloween, Valentines Day, or New Years, my Mom made a big deal about them and created family rituals that created great childhood memories that cannot be clouded out. Thanksgiving was a big family time which we often spent with my Dad’s family on the old family homestead near Waldport. The smells of a grand holiday meal lie deeply embedded in my soul. 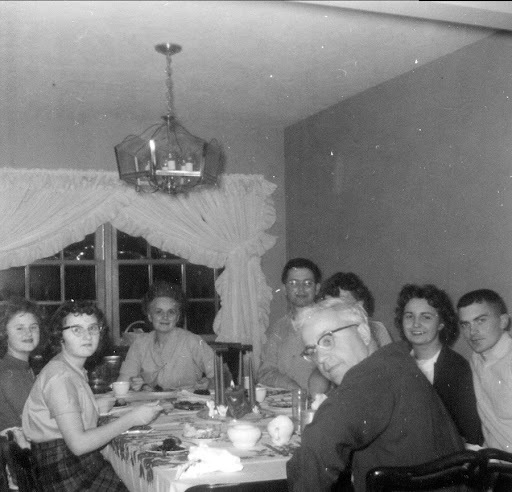 Thanksgiving most likely remains my favorite holiday due to the low-pressure family gatherings. The granddaddy of all holidays was Christmas. There were cookies and treats, music and decorations, and lots of gift-giving (receiving?) anticipation. We always went out and cut our own tree. The family decorating party was filled with love and Rockwellian joy. Christmas music became the soundtrack of our lives for a month. And for the days surrounding December 25th, we drove back and forth across the Portland Metro area visiting family and friends. Listening to The Cinnamon Bear story on KXL/1190am was a big part of our lives between Thanksgiving and Christmas. 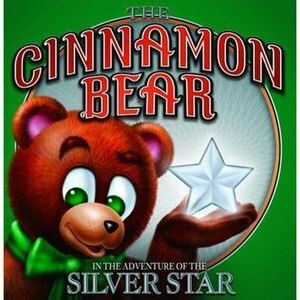 Often we would find time to visit the Cinnamon Bear at the Lipman’s Department store. Then, of course, we’d make a big deal around the visit to Santa Clause at Meier & Frank’s! Christmas is different for me now. Fortunately it’s not all about me and what I get. Now, more than ever, I understand the reason for the season. But it is more than that. I would like to repeat all the rituals that made Christmas fun. I would like to share the joy I experienced as a kid. The cookies and treats, the Christmas Morning excitement, and the Santa Claus mythology. In many ways, I’d like to repeat these experiences for my kids. But I can’t – or I should say, I don’t want to. Instead, I want to bring the simplicity that surrounds Thanksgiving back into the Christmas holiday. I’m tired of the commercialism; I’m tired of the crass marketing; and I’m tired of myths of Santa Claus and the greed and misnomers he represents. I see too many people stressed and too many expectations that people try to meet. For me, it isn’t worth financial and emotional debt. Jesus came to show us God’s true character. He is about giving, not receiving. He stands for grace and forgiveness, not whether we’ve been “naughty or nice.” The love of God far outshines the jolly of Old St. Nick. This is what I want to teach my children. This is what I want to share with those around me. I want them to experience God’s love, in real, practical ways. I want them to experience God – not rituals. It is a difficult tightrope one walks when deciding to put Christ back into Christmas. I don’t want to be perceived as some right-wing, religious fundamentalist. I don’t intend to be a kill-joy. I just want the simplicity of an unselfish, commercial-free Christmas season. The last thing I want to do is emulate Scrooge. To me, Dickens was trying to emulate the true spirit of Christmas through Scrooge’s conversion and kindness to the Cratchit family. But somehow we remember the pre-dream Scrooge and not the post-dream kindness he came to appreciate. What if we had similar conversions and replaced the commercialism with compassion? This year, in our family gift-giving encounters, we have asked for some simple gifts. Instead of exchanging gift-cards for big-box retailers – for stuff we don’t need. We’ve asked our families to buy gifts for less fortunate World Citizens, in honor of the love they have for us. There are plenty of organizations out there. One can support local, regional, national, or global organizations. It really doesn’t matter. Either way, let’s replace commercialism with compassion. This is interesting — most people talk about eschewing the mainstream gifts and then emphasizing the cookies, treats, traditions, etc. But you seem to be suggesting that that stuff needs to go, too? Or is it just that we need to simplify, and not be worrying about baking 25 different kinds of cookies that need to be packaged up and given to everyone in our lives? I actually don’t think the cookies, treats, etc are bad – but some of the mythology surrounding Christmas seems to detract from some of the true values of family, grace, mercy, and love. Let’s focus on family and compassion, like we do around Thanksgiving! Nice post. Again, you bring forth food for thought. This year, in addition to the choices you mention, we have the opportunity to make a difference right here at home. Something as simple as clean water can make a huge difference in many parts of the world, but living can actually be difficult here in the US. While someone may have a color TV sitting in their kitchen, they may not have the money for food and the TV is not worth enough to trade for a meal. The high cost of living in the US can be an impediment to living when one has no resources. Even growing vegetables and herbs is difficult if all you have is an apartment patio covered in concrete and no dirt available. Think about giving to the Oregon Food Bank or helping with another local program. I can guarantee you’ll see the results on the streets where you live. @memathews Thanks for the additional resources. I totally agree, we don’t have to go clear around the world to share and have compassion. I used to be a regular contributor to Union Gospel Mission. As a former street-medic, I saw the good things they did for those on the streets of PDX. @blogan Are you being sarcastic in your last statement, or true? Hard to tell from this end. @wifenkids and I had a deep conversation tonight about the balance between being a killjoy and helping grandparents join us in this parenting journey. It can be a tough balancing act. Tonight, again, we were listening to Abigail Stewart’s commentary on Valley Forge. She was 11 years old when she wrote about the revolutionary army’s winter there. Her description of soldiers without shoes, socks, pants, or coats breaks my heart every time I hear it. It is part of what inspired this post. Yeah, as soon as I pressed submit, I realized the last line and smilie could be interpreted as sarcastic instead of happy. Oops! I intended the happy meaning. @blogan – thanks for the clarification. I’d love to implement all kinds of plugins, if I could, but those of us using WordPress.com don’t have that option. It took me three weeks to figure that out when I first started this blog – but I read a lot of help posts that I wouldn’t ordinarily read and I learned a lot about WordPress! Well said, and I could not agree more!! Those were very touching and influencial words. I don’t know who you are or if you will read this, but if you do, thank you. Thank you for pointing my mind towards the true, right direction, in which we should all be pointing. All too often we think this compasionate way for a little while, and soon turn around to selfish thinking or wanting. Compassion does truely give strength, and Jesus truely is the redeemer of that compassion.